During the summer I find myself on the road a lot. While I enjoy using these trips as an opportunity to try beers I can’t get at home, increasingly I find that it’s not so easy to find places where the beers are better than what I can get back in Columbus. So before heading out on my latest trip, to Idaho and SW Colorado, I packed a few containers of the good stuff from Ohio. 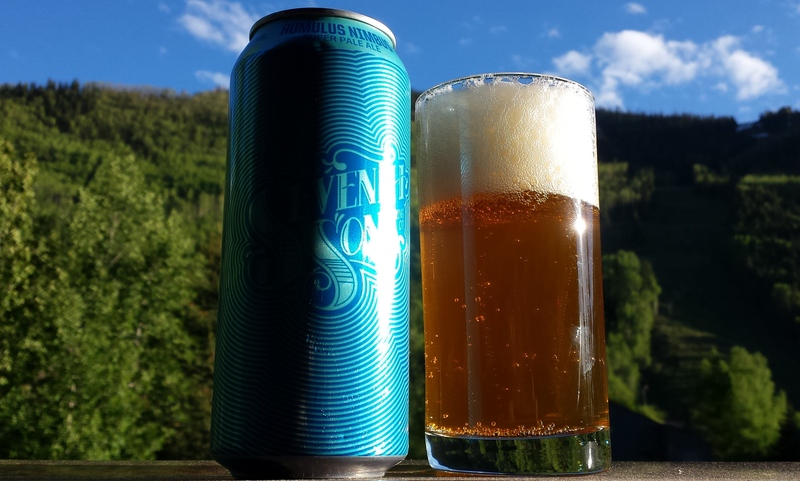 As a result I’m able to bring you a review of one my favorite Columbus beers, Humulus Nimbus Super Pale Ale from Seventh Son Brewing, in a town where the backdrop is equally spectacular, Telluride, Colorado. Somehow it seems fitting to enjoy a beer named (in part) after a cloud, in town whose elevation is 8750 feet above sea level. Seventh Son offers an ever changing rotation of interesting beers, but Humulus Nimbus is one of the few beers they offer year round. It’s also one of only two beers that they distribute in cans, the other being Seventh Son American Strong Ale. Although they call it a pale ale, I would argue that Humulus Nimbus is an IPA in all but name. At 6.0% abv and 53 IBU this hop forward beer would easily pass muster as an IPA at any beer festival in the land. In fact at the Central Ohio IPA Blind Taste Test that I held last fall it finished in 3rd place among a field of 16 local IPAs. The only beers that finished above it were Hoof Hearted’s Musk of the Minotaur IPA and Seventh Son’s Golden Ratio IPA, beers that went on to finish 1st and 4th, respectively, in the King of Ohio IPA Challenge held last October in Columbus. At 9000 feet this pale ale can finally get close to the cumulonimbus clouds that are half of its namesake, even from the balcony of my 2nd floor hotel room. As you can see in the picture above Humulus Nimbus has a golden-amber color, good clarity with a little bit of translucence, and 3+ fingers of delicate white head. As the head settles it leaves behind decent lacing on the sides of the glass. Things start to get interesting when it comes time for the smell test. It’s brimming with an enticing floral and fruity bouquet. The distinctive blueberry notes from the Mosaic hops really pop, but the dank, piney notes from the Simcoe hops are always lurking just below the surface. The taste is hop forward as advertised. The initial tastes are dominated by the exotic melon and blueberry flavors of the Mosaic hops. These flavors gradually transition to the piney and ever so subtle catty notes of the Simcoe hops, before ending with a dry, moderately bitter finish. The mouthfeel is light bodied, effervescent, and dry. Seventh Son likes to push the envelope with their beers and the results can be a little hit or miss, but make no mistake they’ve hit the nail on the head with Humulus Nimbus. There is a boatload of hop aroma and flavor. The exotic fruit flavors of the Mosaic hops pair unexpectedly well with the dank, piney flavors of the Simcoe hops. It’s a pairing made in a high altitude mass of condensed water vapor if there every was one. They manage to get the wow factor from the hops while reining in the sometimes challenging flavors and aromas that can come from these pungent hop varieties. The end result is big on flavor and drinkability. When it comes to IPAs masquerading as Pale Ales I think Humulus Nimbus can hold its own with the highly sought after, often elusive Zombie Dust. So beer lovers everywhere make plans to come to Columbus and get your hands on this spectacular super pale ale. I promise that Seventh Son will have some waiting for you, which is more than Three Floyd’s and Chicago can say about Zombie Dust.